At <www.alcaldianaguanagua.gov.ve> we can see the Flag and the Coat of Arms of Naguanagua Municipality, Carabobo State. 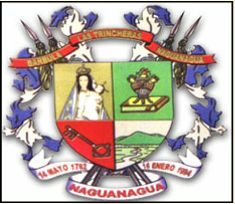 The Coat of Arms is result of the contest open aid promoted by the Naguanagua's Mayor Office on March 20th, 1999. It was presented by the artists Jose Gregorio Guevara and Víctor Martinez and approved according to verdict of the Examining Jury integrated by Licenciate Tulio Ramirez P., Licenciate Loyal Israel, Professor Fredis Arms, Mr. Armando Alcántara B. and Dr. Angel Maria Alvarado. The Naguanagua's Coat of Arms is quartered in cross. First quarter (superior left) on Or (Gold) shows the image of Our Lady of Begoña, remembrance of the faith and devotion of the naguanaguensians for their Matron and the protection of the Divine Providence over the Valley of Naguanagua. Second quarter (superior right) on Vert (Green) for represents the hope in the future and profits derived from the moral and technical illustration, charges a lamp on a book symbolizing the cultural and scientific center of Carabobo University. Third quarter (inferior left) on Gules (Red) shows a golden key for symbolize the municipal autonomy and profits of our political system. Fourth quarter (inferior right) charges a mountainous landscape with a valley and a silvered river, represents the fertility of the grounds as well as the ecological lung of the city, the thermal water center of Las Trincheras (The Trenches) and one battlefield of the Venezuelan Independence War. As external ornament the crossed lances behind the Coat of Arms, like war trophies, symbolizes the value and courage of the Patriotic Army in the battles released on majestic hills of Naguanagua. The Silver (White) and Azure (Blue) lambrequins (adornments generally in form of maple leaves, which starting upward the Coat of Arms, falls capriciously to both sides), symbolizes the qualities and virtues of the citizens worthy to guide the Municipality destinies. Two pennants completes the Coat of Arms: the superior one in Gules (Red) with a golden inscription that recall the battles of Bárbula, Trincheras and Naguanagua (verified in Venezuelan Independence War), and the inferior one in Silver (White) with ephemeris wrote in Gules (Red): "14 de Mayo de 1782" (May 14th, 1782), Foundational Date of the City; "16 de Enero de 1994" (January 16th, 1994), Date of the Municipal Autonomy. Flag: Conceived and designed by Mr. Armando Alcántara Borges, Official Chronicle of the City, it was presented with its corresponding decree to the City Council and unanimously approved in the Extraordinary Session N°. 22 on May 12th, 2000. Two days later in the "Naguanagua´s Day" it was hoisted by first time with the accords Naguanagua's Anthem. The flag is rectangular with approximate ratio 2:3. Meaning: Sky-blue represents the Carabobensian sky which covers the Municipal scope and the sacred mantle of Virgin of Begoña, under whose divine protection was yesterday, is today and will be tomorrow and always the Naguanagua´s Valley. Green, color of the hope, remember the agriculturist potential of Naguanagua, generator of work and main source of life for the villagers. Simultaneously that also denotes the ecological potential of the municipality, represented by the majestic mountains and forests that surround it and which bring forth the springs that nourish the fluvial current of the Cabriales, the most important river in the region. Yellow represents nobility, justice, perseverance and the constance of the naguanaguensians for obtain their autonomy. Simultaneously it symbolizes the social and economic potentiality of the municipality, characterized by the crafts and the commerce, generating activities of wealth and well-being for those who assumes the noble task of let grow and projecting the society and local scope. Upward at the center, the flag shows the Naguanagua´s Coat of Arms with all its attributes.